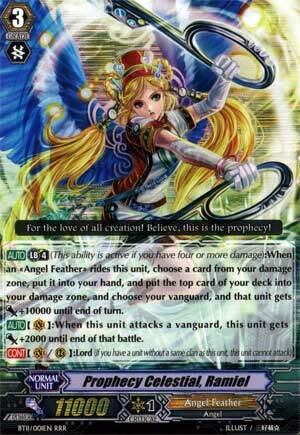 [AUTO] Limit Break 4 (This ability is active if you have four or more damage):When an «Angel Feather» rides this unit, choose a card from your damage zone, put it into your hand, and put the top card of your deck into your damage zone, and choose your vanguard, and that unit gets [Power]+10000 until end of turn. ...so we're starting off with the Angel Feather Break Ride? It's definitely an interesting card seeing how it not only gives you the generic +10,000 power, but also lets you take any card in your Damage Zone to your hand and puts the top card of your deck to the Damage Zone. This can get really abusive depending on if you have any Pegasei on the field to gain or also an impact when added with Celestials. There are other details about this card, but it's pretty simplistic and only adds onto Ramiel's overall stellar design.